Definition at line 18 of file Icmp.h. Referenced by Icmp6::SendEcho(), and Icmp4::SendEcho(). Definition at line 19 of file Icmp.h. Referenced by Icmp4::Recv(), and Icmp4::SendEcho(). Definition at line 20 of file Icmp.h. Referenced by Icmp6::Recv(), and Icmp6::SendEcho(). 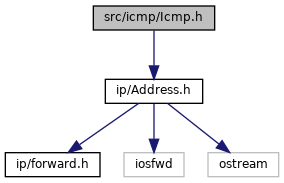 Definition at line 16 of file Icmp.h. Referenced by IcmpPinger::Recv(), Icmp6::Recv(), and IcmpSquid::SendEcho(). Definition at line 94 of file pinger.cc.